For the queen of Greek mythology, see Agave (mythology). For the ethnic group in Ghana, see Agave people. See text. See also full listing. Along with plants from the closely related genera Yucca, Hesperoyucca, and Hesperaloe, various Agave species are popular ornamental plants in hot/dry climates, as they require very little supplemental water to survive. Most Agave species grow very slowly. Some Agave species are known by the common name "century plant". The succulent leaves of most Agave species have sharp marginal teeth, an extremely sharp terminal spine, and are very fibrous inside. The stout stem is usually extremely short, which may make the plant appear as though it is stemless. Agaves can be confused with cacti, aloes, or stonecrops, but although these plants all share similar morphological adaptations to arid environments (e.g. succulence), each group belongs to a different plant family and probably experienced convergent evolution. Further, cactus (Cactaceae) and stonecrop (Crassulaceae) lineages are eudicots, while aloes (Asphodelaceae) and agaves (Asparagaceae) are monocots. Agave species are used as food plants by the larvae of some Lepidoptera (butterfly and moth) species, including Batrachedra striolata, which has been recorded on A. shawii. The agave root system, consisting of a network of shallow rhizomes, is designed to help the agave efficiently capture moisture from rain, condensation and dew. In addition to growing from seeds, most agaves produce 'pups' – young plants from runners. Agave vilmoriniana (the octopus agave) produces hundreds of pups on its bloom stalk. Agave leaves store the plant's water and are crucial to its continued existence. The coated leaf surface prevents evaporation. The leaves also have sharp, spiked edges. The spikes discourage predators from eating the plant or using it as a source of water and are so tough that ancient peoples used them for sewing needles. The sap is acidic. Some agaves bloom at a height up to 30 ft (9 m) so that they are far out of reach to animals that might attack them. Smaller species, such as Agave lechuguilla, have smaller bloom stalks. In the Cronquist system and others, Agave was placed in the family Liliaceae, but phylogenetic analyses of DNA sequences later showed it did not belong there. In the APG II system, Agave was placed in the family Agavaceae. When this system was superseded by the APG III system in 2009, the Agavaceae were subsumed into the expanded family Asparagaceae, and Agave was treated as one of 18 genera in the subfamily Agavoideae. In some of the older classifications, Agave was divided into two subgenera, Agave and Littaea, based on the form of the inflorescence. These two subgenera are probably not monophyletic. Agaves and close relatives have long presented significant difficulties to the biological field of taxonomy. These difficulties could be due to the relatively young evolutionary age of the group (major diversification events of the group most likely occurred 8-10 million years ago), ease of hybridization between species (and even genera), incomplete lineage sorting, and long generation times. Within a species, morphological variations can be considerable, especially in cultivation; a number of named species may actually just be variants of original wild type species that horticulturalists bred to appear unique in cultivation. Some commonly grown species include Agave americana, Agave angustifolia, Agave tequilana, Agave attenuata, Agave parviflora, Agave murpheyi, Agave vilmoriniana, Agave palmeri, Agave parryi and Agave victoriae-reginae. A row of Agaves in bloom in the Karoo region of South Africa. The inflorescence of the plants are clearly visible. One of the most familiar species is Agave americana, a native of tropical America. Common names include century plant, maguey (in Mexico), or American aloe (not related to the genus Aloe). The name "century plant" refers to the long time the plant takes to flower. The number of years before flowering occurs depends on the vigor of the individual plant, the richness of the soil, and the climate; during these years the plant is storing in its fleshy leaves the nourishment required for the effort of flowering. Agave americana, century plant, was introduced into southern Europe about the middle of the 16th century, and is now widely cultivated as an ornamental, as it is in the Americas. In the variegated forms, the leaf has a white or yellow marginal or central stripe. As the leaves unfold from the center of the rosette, the impression of the marginal spines is conspicuous on the still erect younger leaves. The plant is reported being hardy to -9.5 - -6.5c or Zone 8b 15-20f. Being succulents they tend to rot if kept too wet. In areas like America's Pacific North West, they might be hardy for cold winter temperature, but need protection the winter rain. They mature very slowly and die after flowering, but are easily propagated by the offsets from the base of the stem. Blue A. americana occurs in abundance in the Karoo, and arid highland regions of South Africa. Introduced by the British settlers in 1820, the plant was originally cultivated and used as emergency feed for livestock. Today it is used mainly for the production of syrup and sugar. A. attenuata is a native of central Mexico and is uncommon in its natural habitat. Unlike most species of agave, A. attenuata has a curved flower spike from which it derives one of its numerous common names - the foxtail agave. A. attenuata is also commonly grown as a garden plant. Unlike many agaves, A. attenuata has no teeth or terminal spines, making it an ideal plant for areas adjacent to footpaths. Like all agaves, A. attenuata is a succulent and requires little water or maintenance once established. Agave azul (blue agave) is used in the production of tequila. In 2001, the Mexican Government and European Union agreed upon the classification of tequila and its categories. All 100% blue agave tequila must be made from the Agave tequilana 'Weber's Blue' agave plant, to rigorous specifications and only in certain Mexican states. The hybridized genus ×Mangave is created by cross-breeding species of Manfreda and Agave. But the miracle of nature was the great Mexican aloe, or maguey, whose clustering pyramids of flowers, towering above their dark coronals of leaves, were seen sprinkled over many a broad acre of the table-land. As we have already noticed its bruised leaves afforded a paste from which paper was manufactured, its juice was fermented into an intoxicating beverage, pulque, of which the natives, to this day, are extremely fond; its leaves further supplied an impenetrable thatch for the more humble dwellings; thread, of which coarse stuffs were made, and strong cords, were drawn from its tough and twisted fibers; pins and needles were made from the thorns at the extremity of its leaves; and the root, when properly cooked, was converted into a palatable and nutritious food. The agave, in short, was meat, drink, clothing, and writing materials for the Aztec! Surely, never did Nature enclose in so compact a form so many of the elements of human comfort and civilization! There are four major parts of the agave that are edible: the flowers, the leaves, the stalks or basal rosettes, and the sap (in Spanish: aguamiel, meaning "honey water"). Each agave plant will produce several pounds of edible flowers during its final season. The stalks, which are ready during the summer, before the blossom, weigh several pounds each. Roasted, they are sweet and can be chewed to extract the aguamiel, like sugarcane. When dried out, the stalks can be used to make didgeridoos. The leaves may be collected in winter and spring, when the plants are rich in sap, for eating. The leaves of several species also yield fiber: for instance, Agave sisalana, sisal hemp, Agave decipiens, false sisal hemp. Agave Americana is the source of pita fiber, and is used as a fiber plant in Mexico, the West Indies and southern Europe. The agave, especially Agave murpheyi, was a major food source for the prehistoric indigenous people of the Southwestern United States. The Hohokam of southern Arizona cultivated large areas of agave. The Navajo similarly found many uses for the agave plant. A beverage is squeezed from the baked fibers, and the heads can be baked or boiled, pounded into flat sheets, sun dried, and stored for future use. The baked, dried heads are also boiled and made into an edible paste, eaten whole, or made into soup. The leaves are eaten boiled, and the young, tender flowering stalks and shoots are roasted and eaten as well. The fibers are used to make rope, the leaves are used to line baking pits, and the sharp pointed leaf tips are used to make basketry awls. During the development of the inflorescence, sap rushes to the base of the young flower stalk. Agave nectar (also called agave syrup), a sweetener derived from the sap, is used as an alternative to sugar in cooking, and can be added to breakfast cereals as a binding agent. Extracts from agave leaves are under preliminary research for their potential use as food additives. The sap of A. americana and other species is used in Mexico and Mesoamerica to produce pulque, an alcoholic beverage. The flower shoot is cut out and the sap collected and subsequently fermented. By distillation, a spirit called mezcal is prepared; one of the best-known forms of mezcal is tequila. Agave tequilana or Agave tequilana var. azul is used in the production of tequila. Agave angustifolia is widely used in the production of mescal and pulque, though at least 10 other Agave species are also known to be used for this. Agave can be used as the raw material for industrial production of fructans as a prebiotic dietary fiber. Resulting from its natural habitat in stressful environments, agave is under preliminary research for its potential use in germplasm conservation and in biotechnology to better anticipate the economic effects of global climate change. It may also have use as a bioethanol or bioenergy feedstock. ^ "agave noun". Oxford Learner's Dictionaries. Oxford University Press. ^ An Anglo-Hispanic pronunciation. Sunset Western Garden Book, 1995:606–607. ^ "agave - Wiktionary". en.wiktionary.org. Retrieved 2019-03-26. ^ a b Gentry, Howard S. (1982). Agaves of Continental North America. Tucson, Arizona: The University of Arizona Press. ISBN 978-0-8165-0775-7. ^ a b c d e f Gentry, Howard S. (1982). Agaves of Continental North America. Tucson, Arizona: The University of Arizona Press. ISBN 978-0-8165-0775-7. ^ a b c d 1949-, Irish, Mary (2000). Agaves, yuccas, and related plants : a gardener's guide. Irish, Gary. Portland, Or. : Timber Press. ISBN 978-0881924428. OCLC 41966994. ^ Bailey, L.H. ; Bailey, E.Z. ; the staff of the Liberty Hyde Bailey Hortorium. 1976. Hortus third: A concise dictionary of plants cultivated in the United States and Canada. Macmillan, New York. ^ Males, Jamie (2017). "Secrets of succulence". Journal of Experimental Botany. 68 (9): 2121–2134. doi:10.1093/jxb/erx096. PMID 28369497. ^ a b Mark W. Chase, James L. Reveal, and Michael F. Fay. 2009. "A subfamilial classification for the expanded asparagalean families Amaryllidaceae, Asparagaceae, and Xanthorrhoeaceae". Botanical Journal of the Linnean Society 161(2):132-136. ^ a b David J. Bogler, J. Chris Pires, and Javier Francisco-Ortega. 2006. "Phylogeny of Agavaceae based on ndhF, rbcL, and ITS sequences: Implications of molecular data for classification". Aliso 22 (Monocots: Comparative Biology and Evolution):313-328. ^ Heyduk, Karolina; McKain, Michael; Lalani, Falak; Leebens-Mack, James (2016). "Evolution of a CAM anatomy predates the origins of Crassulacean acid metabolism in the Agavoideae (Asparagaceae)". Molecular Phylogenetics and Evolution. 105: 102–113. doi:10.1016/j.ympev.2016.08.018. PMID 27591171. ^ "Agave americana". Missouri Botanical Garden. ^ "USDA Plant Hardiness Zone". ^ Beinart, William; Coates, Peter (2002). Environment and history: The taming of nature in the USA and South Africa. New York, NY: Routledge. p. 41. ISBN 978-0415114684. ^ Hatch, Laurence C. (2017-04-22). International Register of Ornamental Plant Cultivars:: OROC Book IV: Hardy Herbaceous Perennials. Cultivar.org. ^ Calhoun, Scott (2012-11-09). Designer Plant Combinations: 105 Stunning Gardens Using Six Plants or Fewer. Storey Publishing. ISBN 9781603420044. ^ Davidson, Alan (1999). The Oxford Companion to Food. Oxford: Oxford University press. ISBN 978-0-19-211579-9. ^ Fish, Suzanne K.; Fish, Paul R.; Madsen, John H. (1992). "Evidence for Large-scale Agave Cultivation in the Marana Community". The Marana Community in the Hohokam world. Tucson: University of Arizona Press. Archived from the original on 2013-05-07. Retrieved 1 June 2012. ^ "results of search". umich.edu. Retrieved 12 July 2015. ^ Chomka, Stefan (30 July 2007). "Dorset Cereals". The Grocer. Retrieved 16 January 2011. ^ a b López-Romero, Julio Cesar; Ayala-Zavala, Jesús Fernando; González-Aguilar, Gustavo Adolfo; Peña-Ramos, Etna Aida; González-Ríos, Humberto (2018). "Biological activities of Agave by-products and their possible applications in food and pharmaceuticals". Journal of the Science of Food and Agriculture. 98 (7): 2461–2474. doi:10.1002/jsfa.8738. ISSN 0022-5142. PMID 29023758. ^ Tamayo‐Ordóñez, M. C.; Ayil‐Gutiérrez, B. A.; Tamayo‐Ordóñez, Y. J.; Rodríguez‐Zapata, L. C.; Monforte‐González, M.; De la Cruz‐Arguijo, E. A.; García‐Castillo, M. J.; Sánchez‐Teyer, L. F. (2 October 2018). "Review and in silico analysis of fermentation, bioenergy, fiber, and biopolymer genes of biotechnological interest in Agave L. for genetic improvement and biocatalysis". Biotechnology Progress. 34 (6): 1314–1334. doi:10.1002/btpr.2689. ISSN 8756-7938. PMID 30009567. ^ Yan, X.; Tan, D.K.Y. ; Inderwildi, O.R. ; Smith, J.A.C. ; King, D.A. (2011). "Life cycle energy and greenhouse gas analysis for agave-derived bioethanol". Energy & Environmental Science. 4 (9): 3110. doi:10.1039/C1EE01107C. ^ Stewart, J. Ryan (24 September 2015). "Agave as a model CAM crop system for a warming and drying world". Frontiers in Plant Science. Frontiers Media SA. 6: 684. doi:10.3389/fpls.2015.00684. ISSN 1664-462X. PMC 4585221. PMID 26442005. 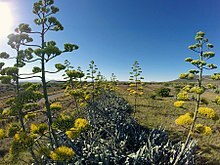 Wikimedia Commons has media related to Agave. Howard Scott Gentry, Agaves of Continental North America (University of Arizona Press, 1982), the standard work, with accounts of 136 species. Native Plant Information Network More information on species in the genus Agave. Xeric World An online community dedicated to the study of Xeric plant species with a focus on the family Agavaceae. Davidson, Alan (1999). The Oxford Companion to Food. Oxford: Oxford University press. ISBN 978-0-19-211579-9.